After two years of writing, I’m very happy to announce that I’ve finally released the sequel to A Flight of Marewings. I hope you’re ready, because here comes the next book in the Wyld Magic series! Gryphons are deadly in small numbers. 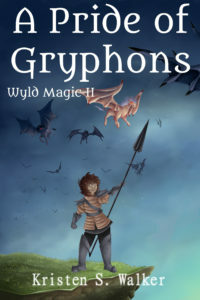 When wyld magic calls them to attack in great force, they could be strong enough to level a nation. And now they’re coming for Kyratia. Korinna saved her city from a dangerous cult and became the new duchess of Kyratia. But ruling brings a whole new set of challenges and this time, she won’t be able to fight her way through. Monsters are attacking Kyratia again, but her husband Galenos warns that the law forces all rulers to retire from fighting so they can’t join the battle. Korinna is frustrated by the slowness of politics, but riding her marewing could threaten her new pregnancy. A sinister power lurks behind the monster attacks, calling gryphons to swarm the countryside in greater numbers than there have ever been. Korinna will have to find a power of her own to confront them, or everything she’s won so far could be destroyed.